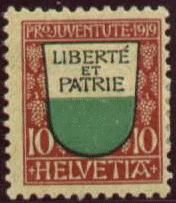 Aan oddly colored image from an outside source: A 1911 Swiss postage stamp, seen at http://naxum.tripod.com/heraldry/17xch109.jpg, in Nahum Shereshevsky's excellent thematic philatelic collection, see it fully http://www28.brinkster.com/naxum/her2001/hera00.htm: Black letters, instead of black-fimbriated golden letters. This must be an often "practical" variation, as also the letterless variation above. Vaudois friends very probably can give more profound information to this topic. I only can report Mühlemann (1991). The decree from 1803 about the cantonal coat of arms doesn't define the colours of the writing. "Initially" it always was depicted in black. I suppose this has to do with the printed version (and the seal) on documents which has always been black & white. Mühlemann didn't or couldn't define the time when the colour turned from black to gold. He reports about two green-white military flags with golden writings which could explain the origin of the golden letters. The one flag from 1804 has the golden writing LIBERTE ET PATRIE and CANTON DE VAUD, the other one is a battalion flag from 1819 with the same writing, also in gold. However, the change from black to gold was not radical. There are examples of black writing when the gold variant was already established, e.g. the flag from 1849 of a philanthropic society which shows the cantonal coats of arms beside each other.